Disclaimer: The Unique Melody 3DD-Ti was sent to us a sample in exchange for our honest opinion. We thank Unique Melody for this opportunity. 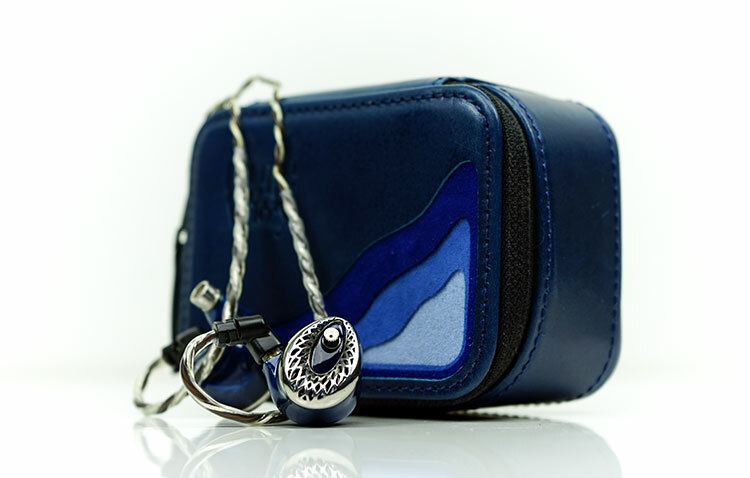 To learn more about Unique Melody products on Headfonics you can click here. 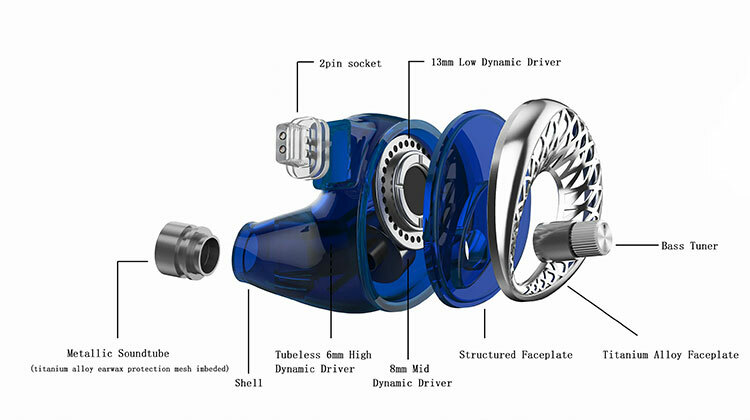 Mixing up drivers in today’s IEM market usually comes in the form of a hybrid combination of single dynamic and multiple balance armatures or even AMT drivers. That is probably the most popular combination in the market today ranging from the FiiO F9 at $99 right up to the oBravo RA C-Cu at $9999. Now around 4-5 years ago the whole dual dynamic driver craze tried to take off without a huge amount of success. Put that down to a lack of big brand backing or perhaps just poor tuning but they never sounded as convincing as single DD or hybrids. UM did, however, go one step further in 2012 with the 3DD which was a musical monster of a triple dynamic driver universal monitor. This was a 1x 13mm Low, 1x 8mm Mid & 1x 5.5mm High configuration all designed in-house with a tunable bass option. Given the complexity of monitor designs, I guess UM felt the time was right to give the 3DD a bit of facelift and some better drivers than the original. Technically this is not a hybrid being of a pure dynamic driver and no balanced armature of the latest craze, stats tweeters. Inside, you get a single 13mm driver for the low-end, an 8mm for the mids and a micro-DD 6mm for the highs controlled via a 3-way passive crossover network. Compare this with the older 3DD configuration of a smaller 5.5mm for then you may have an idea of where some of the more immediate improvements are on the newer version. However, this is not just a duplication of the original 3DD with better drivers. A lof UM’s more recent technology has been slipped into the 3DD-Ti along with a far more striking looking 3D-DLP printed shell and titanium faceplate. 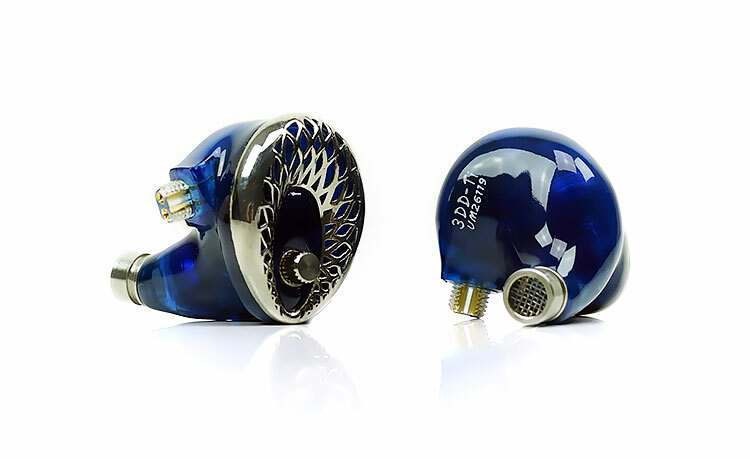 Features such as the dB-Go bass adjuster found from the more expensive Mason V3 as well as their new upgraded cable designs and protruding 2-pin sockets are also included. UM are pitching the presentation as being primarily for music lovers so the 3DD-Ti is not a monitor you could ever classify as a reference-based. Instead, you would not be too far off the mark if you are thinking a solid dynamic driver decay or pace with a fantastic level of depth and more than an air of fun or musical tuning. The size of the 3DD-Ti is surprisingly compact given you are trying to work with 3 dynamic drivers as opposed to BA. This is no Layla in terms of girth, however, the nozzle is quite long, perhaps one of the longest I have seen on a universal IEM to date. I suspect the phase tubing may have something to do with that on the inside combined with the metallic sound tube right on the end of the acrylic body. The shell itself is made of a3D printed acrylic material and is loosely based on the new “universal custom” contoured designs that companies now like to use to maximize the comfort and fit. It is not hugely contoured nor does it need to be because of the long nozzle and tip depth which take up most of the canal. 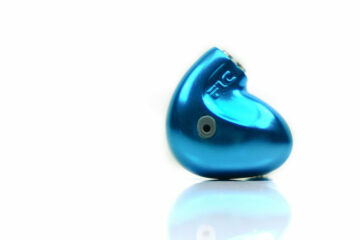 You will find that the majority of the 3DD-Ti body does sit more out of your ear than in the basin of your concha. This is probably ideal as the 2-pin 0.78mm protruding connectors at the top are quite rigid and would likely press uncomfortably against your ear if the body itself was much closer. The 3D printed faceplate is the star of the show. This is an egg-shaped lattice type ring with an opening in the middle where the dB-Go bass attenuator is housed. I am told the final finish of the latticework is by hand including the polishing so each one does go through what seems to be a rigorous process. The quality of the plate is fantastic but also surprisingly lightweight. I was expecting a much heavier type of metal finish but this seems not to be the case. It does remind me of something I have seen before and can’t quite remember what exactly. Ah yes, the Eye of Sauron! Lovely. The cable used with the 3DD-Ti is part of the overhaul UM has done recently with their stock cables. It does have more than a passing resemblance to the excellent 2-tone stock cable of the Mason V3 with that silver and brown weaved PVC cable jacket. However, this is not a 2-tone build so it is not both silver and copper. Instead, it is a single 4-wire copper OFC but of a higher grade of wire than the older plastics one variants they used to ship with. The cable is 1.3m in length with a rather cheap plastic tube for the y-splitter and no cinch. Without a cinch, it can get a bit tangled but it is not a memory retentive cable in its own right. That means the handling is very good when in use and it rarely kinks unnaturally. It is also fairly light with a very quiet noise level before the y-split tube and bit more physical noise beyond the tube. The jack barrel build is straight but very solid aluminum build with a grippy grid design towards the top. You can get it in either 2.5mm or 3.5mm depending on your requirements. This one is a 2.5mm balanced TRRS jack which I use with a 4.4mm converter for balanced on Sony DAPs. The strain relief on the 0.78mm 2-pin connectors is excellent. They are a bit bulky and stick out more than your usual 2-pin due to the protruding connector design but they feel very solid as a result. The 3DD-Ti is actually more than comfortable because of the lightweight nature of the build. The fit is more tip dependent though the contouring of the shell does help plug any gaps. 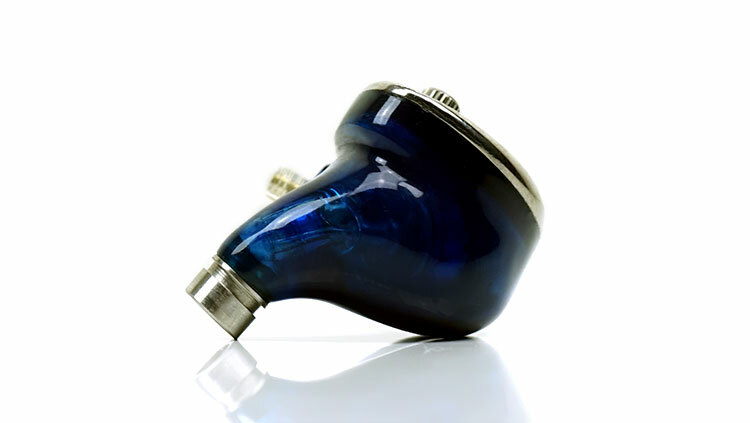 That long nozzle keeps the majority of the body well out of the crevices of your ear so you should not feel any uncomfortable pressure points. You get a reasonable selection of tips for the 3DD-Ti. 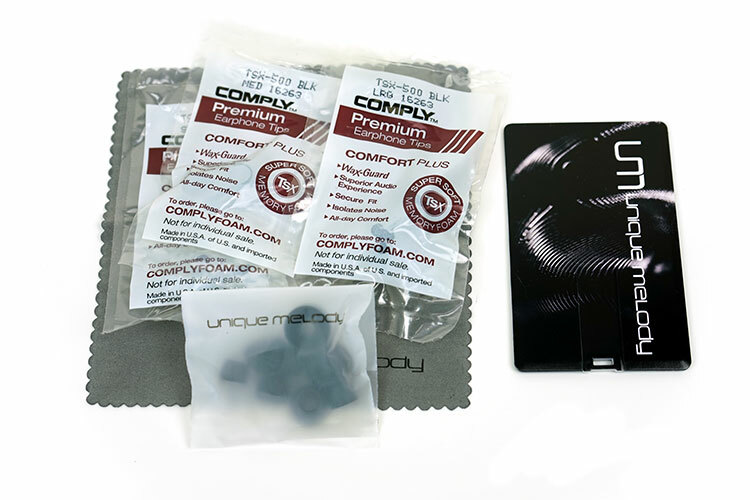 Inside there is a set of large, medium and small T-500 medium-sized Comfort Plus Comply foams and a single set of single bore black silicone tips in large, medium, small and dwarf size, (honestly who has ear canals that small?). With that long nozzle, you will find the 3DD-Ti to be actually very good for isolation despite it’s venting for DD drivers. The depth of the nozzle means that both silicone and foam tips have an above average seal with the foams being the superior of the two for background noise attenuation. Of course, both sets of tips will produce a fairly different sound signature and my preference is with the silicone tips which produce a superior mids and treble response. The Comply foam swill darken the sound and enhance the bass a bit too much for my liking. Tastefully done is the best phrase I can use for the UM 3DD-Ti packaging. The grey flip lid retail packaging box is understated but not poor in quality. It is not as flamboyant as the ME.1 wooden box nor does it have those hardy threaded aluminum/magnesium hard pill-cases from the custom range but nevertheless you will get a decent line-up of accessories. I actually quite like the carry case they have supplied with the 3DD-Ti. It is a 3rd party case supplied by Korean specialists, Dignis. Anyone who has used a Dignis case will tell you they definitely do some nice quality stitched leather cases and this one is no exception. The case is plenty deep, stiffened to cushion against knocks and an internal divider system for drivers, cable, and tips. It also has a multiple blue shading external print design to complement the dark blue tones of the 3DD-Ti shell. The only thing missing that I would have liked is a small net or mesh inside to prevent tips from accidentally falling out but that is mostly nitpicking in an otherwise worthy case.